I have to say after last month’s mammoth empties post I thought this month’s would be a rather short but sweet affair. How wrong I was! Here’s what I’ve used up this month. When an ad for Forlle’d popped up on my Facebook feed I just knew it was worth finding out a little bit more about them. So I sent a little note and they kindly offered to send me some samples to try out. I had hoped to have a full review up by now but I’m still trying to confirm whether either of the UK stockists I’ve found do mail-order. Failing that I’ll have to beg and plead with Ronnie over at On Cloud Nine to order in some stock as I’m not exaggerating when I say these have become my absolute favourite cleansers in the space of the two weeks I’ve been using them. My skin seems to be loving them too and I’ve even managed to skip using Bioderma for a final once over before bed such are their cleansing powers! All it takes is a tiny pea-sized amount of Clearance Cleansing to remove all of my make-up (even on days when I’m wearing my Estee Lauder DoubleWear Foundation!) and then you lather up with the Re-Purerance Wash to prepare your skin for your moisturiser. Both products contain Hyaluronic Acid a non-scary, naturally occurring acid that helps keep skin hydrated and prevent premature ageing. If I could find a UK stockist I’d repurchase the entire range in a heartbeat! I found this months ago in the clearance section of Boots for the grand sum of £2.50. The first thing that struck me about this shampoo was how gelatinous it was, totally unlike any shampoos I have previously used. That said it lathered up well and had a pleasant powdered Palmer’s Cocoa Butter scent to it, which I personally loved but can imagine it may be a tad sickly for some particularly as the scent tends to linger on the hair for a while after washing. Once dry my hair was left smooth and shiny, definitely a vast improvement on my usual frizzy mess! I’m currently on a haircare spending ban but once that’s over a may consider repurchasing if this were on offer but feel the £6.99 rrp is a bit expensive for the size of the bottle. This bad boy featured in my Top Products of 2012 which should tell you all you need to know. I love that it speeds up my blowdrying time, perfect for those “I’d rather wash my hair at 11.30pm than get up early” moments. One bottle lasts an age, but I always repurchase when I hit the 2/3’s empty mark. I reviewed this a few days ago so there’s not really much more to add aside from these little shots of gingery goodness are perfect for ski/surf weekends or when you’re run down and ill and in need of a pick me up. Not an essential repurchase, but I’ll definitely make sure I have some of these little bottles to hand the next time I hit the slopes. I don’t usually use spray deodorants so it’s hard to comment on whether the length of use is equal to that of a usual spray deodorant, but I can say this lasted me near enough 3 months before I hit empty which is better than I’d have imagined for such a small spray. Would I repurchase? Nope, but only because I prefer roll-on deodorants and wasn’t a fan of the granny-like floral scent, though my underarms were the softest they’ve ever been when using this. I bought this on a whim when my beloved St Ives Apricot Body Scrub ran out. It was late, I was tired and this was a snip of the price and yeah, I admit it, I was drawn in by the cute, kitschy packaging. Sitting here now I’m struggling to think of how I would describe it, it was just “meh!”. Not terrible and yet not scrubby enough for my liking either. From day one I regretted not spending out the extra £1.50 to buy St Ives and when it came to repurchasing, yep you guessed it, I grabbed a tub of St Ives Apricot Body Scrub again. Motto of this story? If it ain’t broke, don’t fix it! Ok, I admit it, I may have had a moment of weakness and broken my haircare spending ban just a teensy bit with this purchase but it was 69p and worth every penny! This left my usually straw-like locks soft and silky and I wouldn’t think twice about repurchasing more of these little wonders. 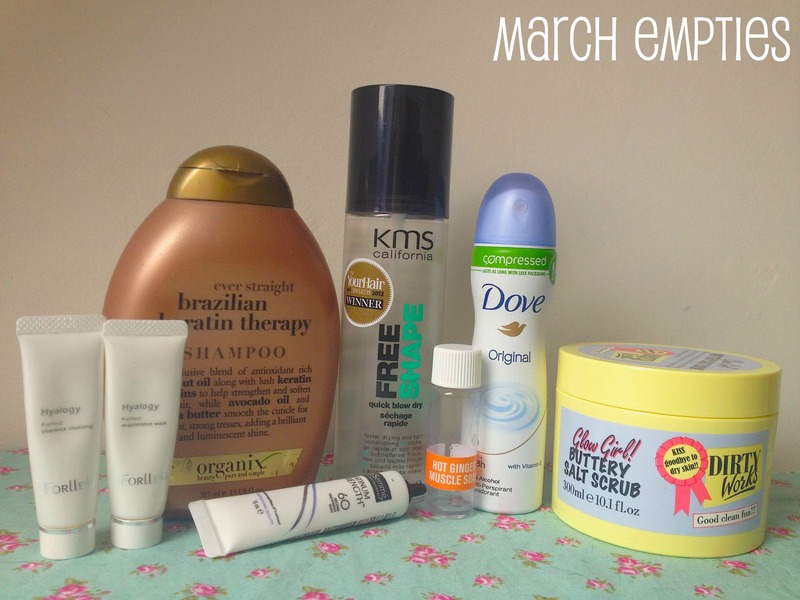 Have you written an empties post this month? Leave me a link in the comments if you have as I’d love to check out what you’ve all been using up.